Chole is an Indian dish that I learned about in my Asian Cuisine class in Culinary School. It is also known as Chana Masala. In this particular class we were focusing on the cuisine of India. We made samosas, chutneys, flat breads, and curries. This is a Northern Indian dish full of spices, onions, tomatoes, and chickpeas. Beautiful and flavorful, perfect on a cold day, and this cleanse. It is vegetarian, vegan, gluten free, the works. We were enjoying the meal at the end of class family style, and someone noticed, there was no meat or dairy on the menu. And every bite was as yummy as the last, a true enjoyment. I loved that class so much, and to think it was a year ago that I made this dish. I remembered it as I prepared for this cleanse, coming up with recipes and such. We made it from scratch using the uncooked chickpeas, but for this recipe I used canned organic chickpeas to shorten cooking time and ease. It is easy to prepare, full of flavor, healthful, and a delight to share with others because of the unique flavors it has. I think of it as a conversation piece of simple food art. I served it with tamarind date chutney and if I were not on this cleanse, I would have also served it with this flat bread recipe. Side Note: Many Indian recipe use beautiful spices that most people don’t keep on hand. My suggestion would be to go to a grocery store that has bulk spices, ask them if the spices are fresh and replenished often. Also, consider visiting your local Indian store and peruse their spice section to add to your spice cabinet. Or buy them online, this is a great company called SavorX with spices you can buy individually in small quantities. This way you can keep an assortment of amazing dry spices on hand for dishes like this. Note: To make this process smooth and easy, get all of the spices you need with a measuring spoon, and spoon them into a small bowl. That way they are ready to go when you need them. Do the same with the ginger, chile Serrano, and garlic, one bowl, ready to add. 1. In a large skillet, heat the oil over medium heat. Once shimmering add the onions and cook until golden brown, about 5 minutes. Add the ginger, chile Serrano, and garlic, cook until fragrant, about 2-3 minutes. Add the spices, and cook for 1 minute. 2. Turn heat to medium low, add the chickpeas, chopped tomatoes, water, and salt. Cook uncovered for 15 minutes over medium low heat. Taste to adjust seasoning. 3. Serve warm in individual bowls, garnish with a sprinkle of cilantro, and a lime wedge. On the table to share, have a basket of warm flat bread, roti, or pita And tamarind date chutney. Optional: serve over 1/2 cup of brown rice. 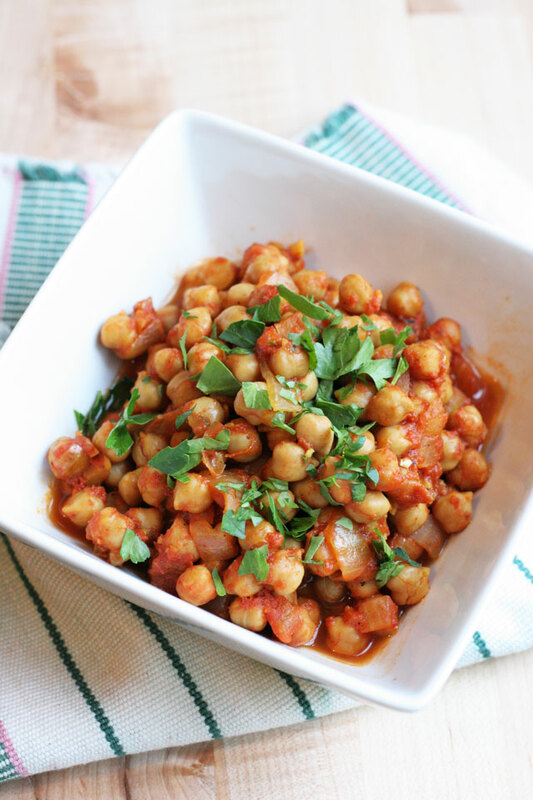 Such a comforting and delicious chickpea dish. This would be great with some protein bread too.